I know the weather is currently fluctuating between sub-zero and arctic tundra, but I can't stop thinking about my summer wardrobe. 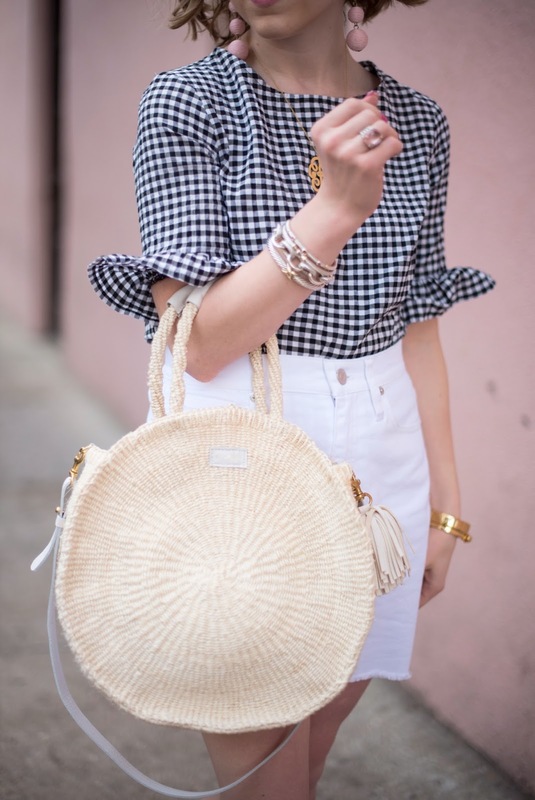 Can we take a second to talk about straw bags? Roughly two summers ago I noticed a few bloggers started showcasing the Cult Gaia Ark bag in Natural. If I remember correctly, the bag originally retailed for under $60 and was structurally unique and appealing. Unlike most trends, this bags cult following has done nothing but grow in recent years. The small size now retails for $148 and they've expanded their collection to include a myriad of colors and sizes. This summer it seemed like I couldn't make it through my Instagram feed without seeing at least three blogger rocking this bag. I'll admit, I'm obsessed with this bag. In my infatuated haze, I've briefly considered buying it multiple times, but instead have admired it with envy from afar. The thing that always stops me from pulling the trigger on this style, now that its available on sites like Amazon for much cheaper, is this: who in gods name carry's their purse by the handle for the entire day? I just can not get over how impractical this purse is! Being someone that frequently carries their life on their shoulder, I can't help but wonder where the hell people are storing their water bottle or snacks? So this leads me to a few other trends popping up. The Claire V Alice bag is larger AND has a convenient shoulder strap, but I don't have $225 to drop on a trendy, seasonal handbag (or any handbag for that matter). So I've scoured the internet for knock offs and actually came up successful. But similar to the Ark bag, most of the Etsy bags I found lacked a shoulder strap. Unless I'm walking directly from a hotel or car to a beach chair (and only staying for an hour or so, because again, a multitude of snacks is essential), where am I going with this in my hand? After considering this purchase for more than any self respecting human ever should, I think I've finally settling on the small circle rattan or straw cross body style, being that its both trendy and practical. Since this style tends to ship from Vietnam or Cambodia, it seems most are within the $35-$80 range after shipping. Urban Outfitters just released a style this week, but I'd have to wait for a 20% off sale before considering pulling the trigger. I have a trip to Florida coming up in March and I hope I'll be able to find something reasonable and practical before then. What are your thoughts? Would you buy a bag that you can only carry in your hand? Are you more practical or trendy with your bag choices? Check out some of the knock off styles I've managed to find below and leave a comment with your thoughts on this popular summer trend.